A modest proportion of Malawians - 14 per cent - are alcohol drinkers. On the other hand, those who do drink have a high and risky consumption level. These were two of the key conclusions in a report presented to the Malawian Minister of Health Wednesday. The report has mapped drinking habits in Malawi. No society is immune from intimate partner violence. Alcohol plays a significant role in those tragic events, breeding violence from the combination of intoxication with ill-conceived images of masculinity and repressive social norms. 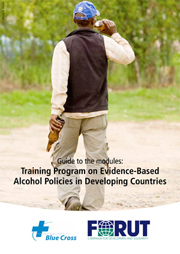 This paper by Professor Diyanath Samarasinghe at the University of Colombo, Sri Lanka, gives an introduction to how the problem of unrecorded alcohol consumption can be understood and how it can be addressed; by communities, governments and NGOs. Three papers by professor Diyanath Samarasinghe explore various aspect of alcohol in a development setting. This booklet is for someone who is interested in learning how to make even his smallest action count. Three papers by professor Diyanath Samarasinghe explore various aspect of alcohol in a development setting. Here he explores the complex connections between alcohol and poverty. Swedish journalist Pierre Andersson has investigated the effects of globalization of alcohol. 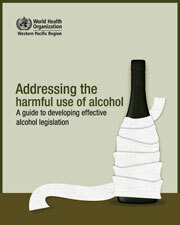 His conclusion in the newly published book "Global Hangover" is simple: alcohol is an obstacle to development. ”When he’s drunk, he becomes mad, he talks at the top of his voice, he beats me and he eats all the relish in the pot, which is not good. I am like a slave to him. I am not happy at all. I don’t enjoy marriage because we have no food, he spends his money on drinking and he comes home late’. The multinational beer and liquor giants have designated the developing countries as their new growth sector for alcohol, since consumption in Western countries appears to be stagnating. And the large youth populations of developing societies will naturally be target group no 1. 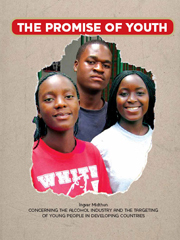 A new booklet from FORUT  The promise of youth  provides some snapshots of this development with examples from India, Sri Lanka and Malawi. FORUT partner Child Workers in Nepal, Concerned Centre (CWIN) has published the report "Impact of Advertisements of Alcohol and Tobacco on Children" based on a study done Nepal. The young people in Nepal consider television advertising to be the most influential instrument in promoting alcohol use among youth and children. The maoist rebels in Nepal have taken a strong stance against alcohol. The result of their campaigns has been the topic for a study by Child Workers in Nepal, Concerned Centre (CWIN), a partner of FORUT. While the anti alcohol campaign has made some impact, the study suggest that rather than taking a prohibition approach the campaign would be more sustainable if the communities were mobilised. Drinking alcohol is not very common among the Sierra Leoneans. The polarised drinking habits exposed in ths stydy may easily lead us to think that the problem is larger than it actuall is in Sierra Leone. These are some of the conclusions of this first survey of the alcohol and drug situation in Sierra Leone after the war. The research report "Alcohol and Poverty in Sri Lanka" is the result of a study by the Norwegian researcher Bergljot Baklien and the Sri Lankan Professor Diyanath Samarasinghe. The studiy is commissioned by FORUT as part of its focus on Alcohol, Drugs and Development. The report is now available on the net (pdf) and with the full text of the Summary on this page. FORUT, Campaign for Development and Solidarity, is a Norwegian NGO in the field of development aid. Since 1981 FORUT has been involved in development assistance in Africa and Asia. FORUT has a special emphasis on alcohol and drugs as a cause of poverty and hindrance to development. Sumnima Tuladhar of CWIN presented the results of a study on alcohol and drug use among street children in six urban centres in Nepal at a FORUT conference recently. The children are very much affected by glue sniffing. The first large-scale alcohol and drug survey in Nepal was conducted by Child Workers in Nepal (CWIN) in collaboration with the Tribhuwan University in Kathmandu. Sensation seeking and significant others drug use and western cultural orientation were shown to predict drug use, whereas a cultural orientation towards the Senegalese cultural context was negatively associated with use. The following publications are available from FORUT and its partners.